Elections Prime Time TV Screen Presence: Which Politicians Were Hit And Which Were Flop? As per Wikipedia, out of 223 million households in India, 134 million have a TV set, and 103 million of these TV set enabled households watch cable television (2010 update). And this data has been growing at a rate of 10% every year. If we leave aside the digitalization of cable TV which is slowly happening all over the country, this is a huge number. Now consider these numbers: In the year 2009, 459 million or 38% of the total population was aged between 13 and 35 years. Out of this number, 333 million were literate, and 62% of this literate youth reside in villages. As per the 2009 report, a typical literate youth in India will spend 98 minutes watching TV every day and 61 minutes listening to radio. Hence, it becomes imperative to assume that whichever politician receives greater screen time on TV has higher chance of being successful in politics as well. But the problem is, politicians can’t control their own visibility (besides social media and advertisements, of course). It’s the editor and journalists who decide which politician has to be presented with which reference and how to present his viewpoint, without being partial to one specific point of view. Let’s find out which politicians were able to garner maximum TV screen time on prime time cable TV in India, especially during the ongoing elections! 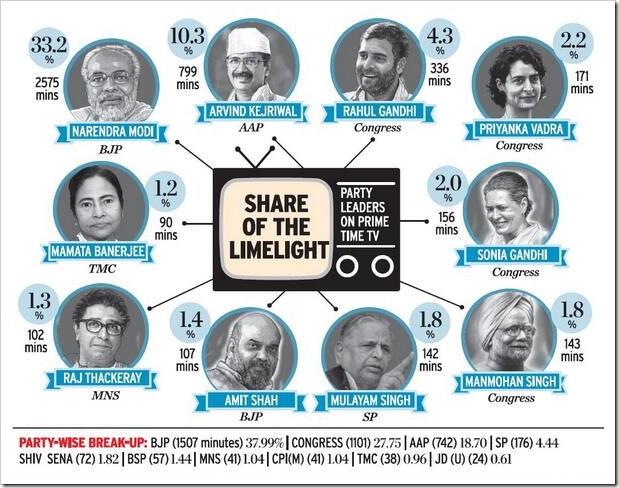 We can clearly see that Narendra Modi has overtaken every politician in the country in terms of prime time coverage. Between April 16 and April 30, his TV screen presence zooms ahead of the curve. Although Arvind Kejriwal started off good with the Delhi election victory in the background, his position continued to slip further, almost stagnating by April 30th. Interestingly, compared to Rahul Gandhi, Priyanka Gandhi received more TV coverage in the later part of the April, which continued to soar well into May as well. B) In another research, 10 politicians : Narendra Modi, Rahul Gandhi, Arvind Kejriwal, Priyanka Gandhi, Mamta Bannerjee, Sonia Gandhi, Raj Thackrey, Amit Shah, Mulayam Singh and Manmohan Singh were tracked on major TV channels such as Aaj Tak, ABP News, Zee News, NDTV 24*7 and CNN IBN and their findings were disclosed. They chose the 8 PM to 10 PM prime time slot for the coverage of these politicians, between March 1 and April 30, 2014 and the results are again similar. With 2575 minutes, Narendra Modi has garnered king’s share of the prime time TV coverage, maintaining a healthy lead of 33.2%. 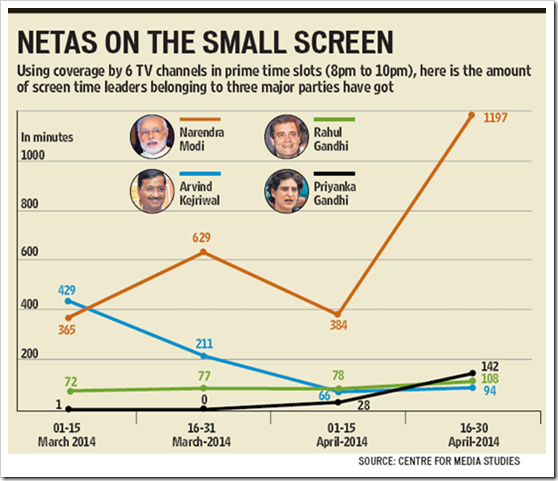 Arvind Kejriwal comes at distant second, with almost a third of prime time TV screen presence at 10.3% or 799 minutes. Rahul Gandhi is at very low end of spectrum at just 336 minutes, with 4.3%. And the most shocking is the prime time screen presence for our current PM: Manmohan Singh. With only 143 minutes, he managed to scrap only 1.8% of the TV slots. Party wise, BJP cornered 37.99% with 1507 minutes while Congress got 22.75% with 1101 minutes. Do share your comments and opinion on the prime time TV screen presence of major politicians this elections. Not much surprising figure. However, I am still shocked to see that AAP got more than 10% coverage and they still cry foul.